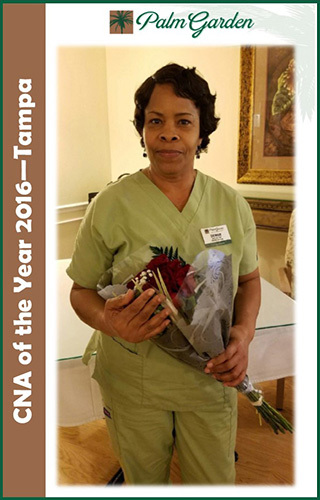 The Palm Garden of Tampa CNA of the Year is Denise Nichols – soon to celebrate her tenth year of service at our facility. Congratulations, Denise. Denise has been a CNA since 1996 – 20 years of providing healthcare services! Before becoming a CNA Denise was a beautician – these qualities help explain why her patients are so in love with her. Not to mention the comments made by her patients, family members and her peers. Commitment to detail, individual care and going the extra mile – this kind of dedication and attention are why she is so popular and deserving of recognition. To provide the little extras – hair care and an extra shower…the little details that make living special – that is her special contribution. If a resident is not eating regularly, it is Denise that provides an extra meal and a cheery smile. It is the testimony of residents and family members that say it best. Co-workers comment she never turns down anybody who needs her or asks for help. She never gets excited, or flustered, she always remains calm. Her supervisor remarked that Denise is awesome, always helpful and cooperative, polite and approachable. She is our poster child for customer service, a fabulous CNA who never misses saying good morning to everyone. Along with her husband, Denise raised 3 girls and one boy…and several of them have followed her into the health care profession. When not at work she enjoys caring for her grandchildren. The accomplishment she is proudest of is how she lives her life and her care for others. While Denise is not one to brag about herself – we will!